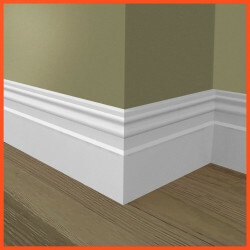 This section has been put together for people who know that they would prefer a detailed skirting board profile, but are not necessarily looking to match a skirting board from a specific period or style. The majority of skirting boards tend to be finished with some level of detailing- it is a great way to add some extra flair as an accent to your overall design. Because our range of detailed skirting boards goes beyond period replicas, there is real variety in terms of the designs available to choose from. We have styles that sit equally well in modern or traditional homes. As a general rule, for a more authentic look in a period or traditional interior design, we would recommend going for a taller skirting board (around the 170mm-220mm mark for height). A more modern feel can be achieved by installing a smaller skirting board in the 95mm-145mm height range. As with all of our products, the detailed skirting boards are available pre primed and fully finished in satin or gloss paint. Because we hand-spray all of our skirting boards, we are able to achieve a far superior finish to anything that you could do with a brush, and on the more detailed skirting board this makes a real difference- definitely something worth considering.